In our last blog post, we shared some of our favorite inspirational projects for revamping your home décor this season. If you'd rather embark on a little Spring Crafting instead of Spring Cleaning, here are some creative ways to accomplish both at the same time, guilt-free! RUGS! April showers may bring May flowers, but they also bring muddy feet to your doorstep. Here is a simple tutorial showing how to recycle old t-shirts into a fashionable and functional (not to mention, machine washable!) crocheted rug. Of course, a woven rug is another option to try: by choosing thick, sturdy yarns in 'spring-y' colors, you can add your own personal touch to your front door. In fact, there are plenty of ways to dress up your doorstep using colorful, easy-care yarns, whether your weave, knit, crochet or rug hook. Below are just a few of our favorite ideas for spring! 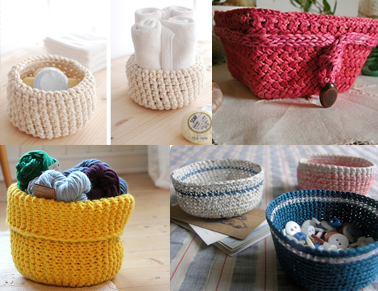 KNIT & CROCHET BASKETS Organize your life with easy-to-make knit or crochet baskets! Baskets are a great way to use up leftover yarn in your stash, but you can also be strategic in your color choice by using cones of yarn to create matching sets or color-coding your world by using an assortment of yarn colors. Smaller sizes are perfect for holding small trinkets or craft supplies, while larger sizes can house your yarn collection, toys, reusable tote bags, or any number of items that need to be contained! ECO-FRIENDLY SPRING CLEANING Save money and the planet by making your own reusable floor sweeper covers! Choose machine washable yarns in bright colors to create an array of color choices to make you smile. 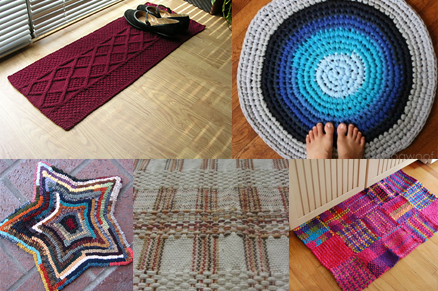 You can find lots of easy patterns to knit or crochet on Ravelry, many of which are free. 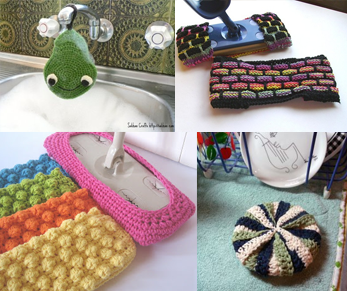 Reusable towels and scrubbers can also be knit, crocheted, or woven, and are an excellent way to save money and the planet! Here's one more spring cleaning tip to try: Eucalan wool wash does double duty; here is a video tutorial from Youtube which uses Eucalan to freshen up curtains and drapes for spring! For more crafty inspiration, click here to view our Welcome Spring inspiration board on Pinterest!